British Columbia has managed its most biggest Entrepreneur draw of all time with the lowest ever least score. The Oct 31 draw viewed 25 invites announced to business applicants, with the least score of 112 points. The earlier most extensive draw took place in Feb 2017 and observed 20 applicants invited for B.C immigration. Regarding the least score, the early lowest was 113, in a Mar 2018 draw. 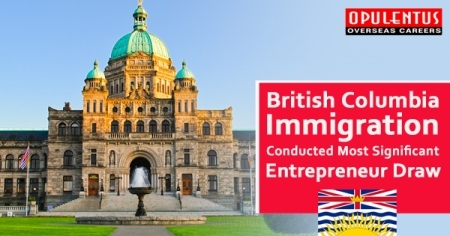 The British Columbia category of Entrepreneur managed its first draw in the month of Nov 2015. In the earlier B.C. business draw on Jul 25, 2018, 14 invites were announced and the least score of 116 needed. Applicants in the category of Entrepreneur can sponsor a crucial staff member for Canada PR. Meanwhile, the recent B.C. usual draw viewed 469 invitations announced via the British Columbia PNP. Skilled worker applicants below the Express Entry of the province and straight provincial streams both needed at least 82 points in the Sept 19, 2018 draw. Foreign graduates below both streams required to score 91 points or higher to qualify. Lastly, semi-skilled and entry-level applications needed 65 points.